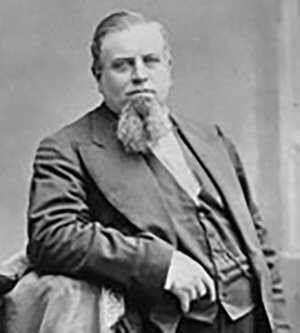 A mountain of a man, Charles Crocker was the only Central Pacific board member, save Theodore Judah, who had traveled any portion of the Pacific Road. 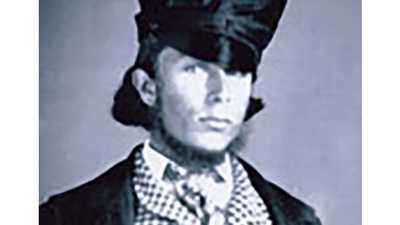 In 1849 Crocker left Indiana to follow older brother Edwin to California. Leading a team of emigrants, he made his way across the Platte Valley in a beeline to Sacramento. By wagon, he traversed the future route of the Union Pacific line. After a false start in mining, Crocker settled into the more leisurely pursuit of dry goods merchant. 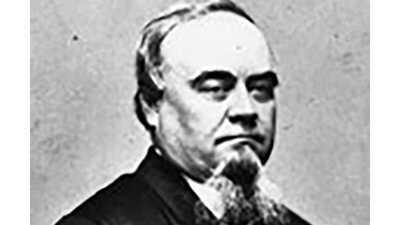 He also joined Sacramento's emerging Republican party, where he became aligned with fellow businessmen Collis Huntington, Leland Stanford, and Mark Hopkins. When Huntington offered him a piece of the railroad in 1860, Crocker leapt aboard. Congress passed the Pacific Railroad Bill in 1862, and the board of the Central Pacific, called the Associates, looked for construction contractors right away. All eyes fell on Crocker, and though he was a board member and had not done a day of construction in his life, he agreed. "I had all the experience necessary. I knew how to manage men; I had worked them in the ore beds, in the coal pits, and worked them all sorts of ways, and had worked myself right along with them." There were advantages to hiring a friend; contractors were typically paid in railroad securities, so absolute control would only stay within the group if an Associate handled the contract. Moreover, whatever percentage of government bonds a contractor might embezzle, well, that money would go to Crocker, again remaining in house. Crocker resigned his position on the board to avoid the obvious conflict of interest. His brother Edwin Crocker filled his place, and in December 1862, the Central Pacific awarded its first construction contract to Charles Crocker & Company. The choice enraged Judah and marked the beginning of the engineer's estrangement. Crocker shrewdly subcontracted the first 18 miles to firms with actual experience. When grading began, he rode alongside, "supervising" their work, watching and learning. As he pressed forward, Crocker gained a feel for the job. He hired James Harvey Strobridge as construction boss. Strobridge's style was to intimidate workers. If intimidation failed, he regularly fell back on physical violence. But Crocker's next move was his canniest. Facing a labor shortage in 1865, he hired Chinese workers. When the first men proved suitable, he sent recruiters across California and into China. 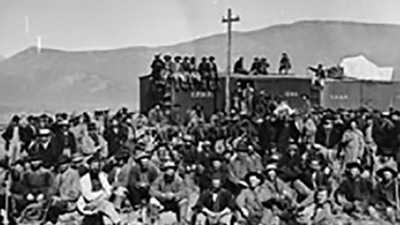 Crocker and Strobridge soon had thousands of men at their command, and it was the Chinese men and their back-breaking work that would get the railroad through the Sierra Nevada. Overseeing physical construction of the rail line was a large burden for a large man. Surmounting Donner Pass was at times an infinitesimally slow process, and the Associates applied constant pressure to meet time or geographical deadlines. Cutting grade, building snowsheds, blasting through hard rock and laying track through snow -- these tasks occupied Crocker into 1868, while his crews worked ahead of him in Nevada, hoping to push forward in the race for territory against the encroaching Union Pacific. Crises were often beyond Crocker's control -- especially crises involving railroad-building supplies. All Central Pacific supplies came from the East, and the Panama Canal shortcut did not exist. Until 1868 all material, rails, rolling stock, and machinery was shipped around Cape Horn at South America's southernmost tip, en route to California. River steamers took the material upriver to Sacramento where it was offloaded to platform cars to go into the mountains. If a single shipment didn't leave the East Coast on time (and often it didn't), or if an accident occurred in the shipping, the resulting delay could be crippling. Frequently Crocker cut corners, telling his crews to spike only seven of every ten rails, or allowing shoddy work along the line. Crocker took intense pride in the ability of his men. While mired in the mountains, he had heard tales of Union Pacific track-laying feats. When the lines finally neared, Crocker decided to prove something to Jack Casement and his Union Pacific workers. On April 20, 1869, thereafter known as "Victory Day", Central Pacific crews laid an extraordinary ten miles of track across the Utah desert between sunrise and sunset. The unheard-of feat brought Central Pacific rail within ten miles of the Union Pacific line, ensuring the Union Pacific could not hope to replicate the achievement. Charles Crocker was the first Central Pacific Associate to ride the completed transcontinental road, tracing his former wagon route back east. In 1870, he and his invalid brother resigned their positions in the company. Charles Crocker would return three years later to a ceremonial position, which he occupied happily until his death in 1888.